There is a 180-degree difference between ‘come’ and ‘go’ yet one little Greek word can be translated as either. Come with me into Chapter Six of the book of Revelation to discover the profound difference. The depiction in Revelation of the heavenly throne-room starts with God the Father sitting on the throne holding a seven-sealed scroll in his right hand. This document represents the title deeds to earth forfeited by Adam and Eve when they rebelled. Someone pictured as a slaughtered lamb steps up as humanities’ redeemer and takes the scroll from the Father. This is of course a representation of the Lord Jesus as the ‘Lamb of God, who takes away the sin of the world!’ (John 1:29). All of creation, heaven and earth, burst into songs of praise, but the climax of the scene is yet to come. Revelation Chapter Six opens with the words: ‘I watched as the Lamb opened the first of the seven seals. Then I heard one of the four living creatures say in a voice like thunder, “Come!”(NIV) This command is given four times, and each time a horseman rides out to afflict the earth. Scholarly commentaries usually contain much debate about the one little word ‘come’. Some try to apply it to John the revelator as in, ‘Come and see’, but this makes little sense. The usual understanding is that the command is addressed to the Horsemen of the Apocalypse, but why would the guardians of the throne of God be calling forth devastation upon the earth when the final judgment of God is not yet in view? This doesn’t make sense to me either. The problem is resolved when we realise that the Greek word translated as ‘come’ may equally well be read as ‘go!’… and what a difference this makes. Scholars like Seiss and Lenski state that the meaning is determined by the context and that ‘Go’ is more appropriate to the context of Revelation Six. The Holman’s Christian Standard Bible gives ‘go’ as an alternative reading and the God’s Word and the International Standard versions don’t even give ‘come’ as an alternative. Satan and his minions know they have to vacate the premises but they fight every meter of the way. What we see portrayed in Revelation 6:2-8 is something all too familiar in countries such as mine where evicted squatters often do as much damage to the property as they can before being forcibly thrown out. The first demonic horseman rides out with satanic authority given it to stir the nations into a frenzy of conquest. The German Third Reich is a good example. Hitler’s goal was world conquest and his first rallying cry was ‘Lebensraum – we need more room to live!’. The inevitable result of conquest is war, which in Nazi Germany’s case followed shortly after the conquest of Poland. So, the second horseman of the Apocalypse represents war. 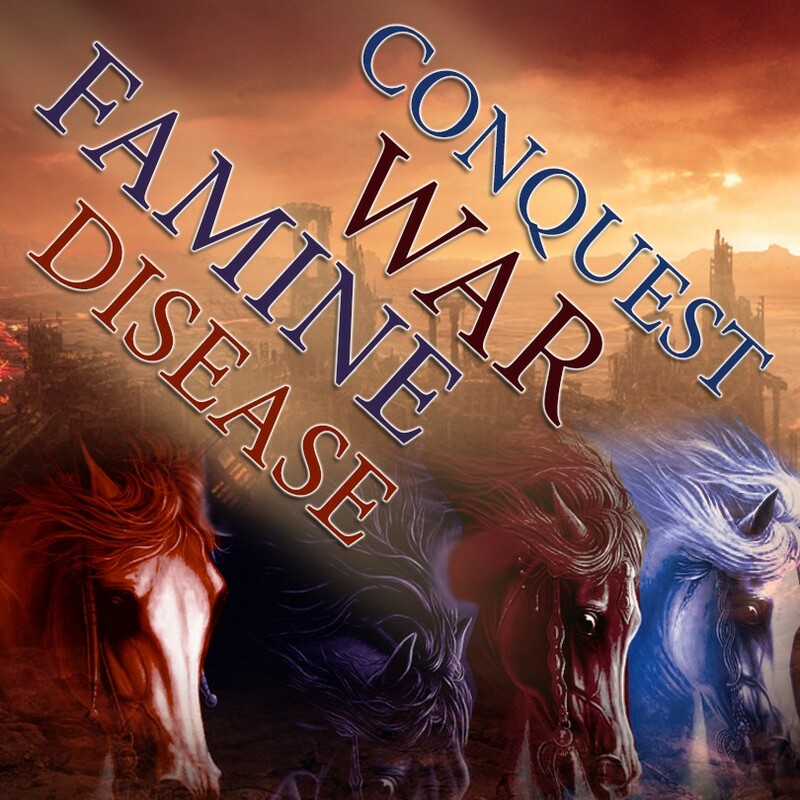 The third horseman represents famine, the natural consequence of the ravages of war, and the fourth horseman represents the disease and death which result from war and famine. Verses 9 to 11 paint a graphic picture of the persecution that invariably follows the devastation of war: When conquests fail then someone needs to be found to take the blame, and the ‘someone’ is usually the people of God. History is replete with the sad record of this evil phenomenon – Rome, Nazi Germany, Communist Russia and China, several African states, and so on. Verses 12-17 portray the final turn of the wheel of conquest-war-famine-pestilence-persecution… holy judgment! God will not allow the persecutors of His people to go unpunished, and so judgment follows persecution as surely as day follows night. I use the analogy of a wheel because the cycle I have just described rolls like a wheel down the timeline of history. As we approach the end-of-days the circumference of the wheel grows larger and it turns faster. Wars become more intense and destructive, and famines and pestilence more widespread and resistant. What is more, in 2013 Reuters reported that about 100 million Christians were suffering persecution! Can divine judgment tarry much longer? In my next post I want to deal with the 144,000 ‘witnesses’ of Chapter Seven: Who do you think they represent? Enchanting read Chris! Gosh, amazing what difference the interpretation of one word makes.